These two new pieces by Kaori Seki made full use of the merits of the venue, Move Hall of Move Machiya.Seen from the slightly sloped audience seats, it provided a spacious theatrical setting that seemed to wrap the dancers up in faint light as they huddled together, all dressed in flesh-colored leotards. 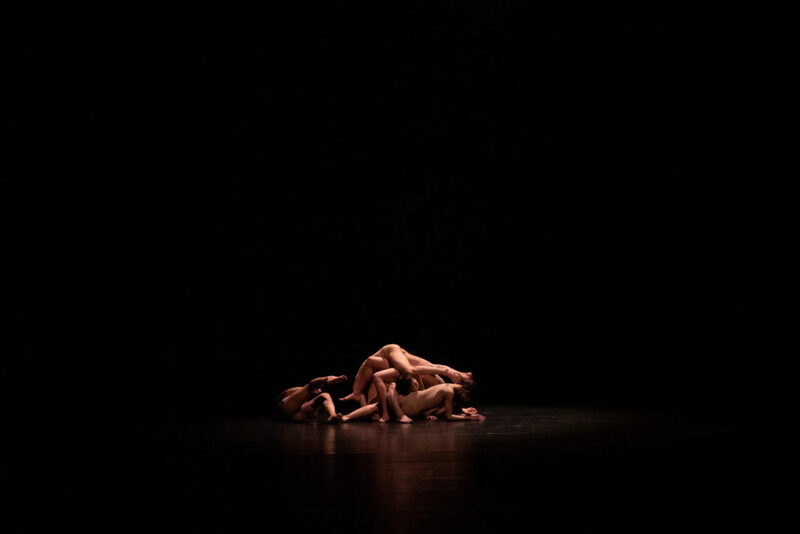 The density of Seki’s choreographic work was clearly visible, and as if in sync with the dancers’ breath, the entire venue slowly began to breathe with them. 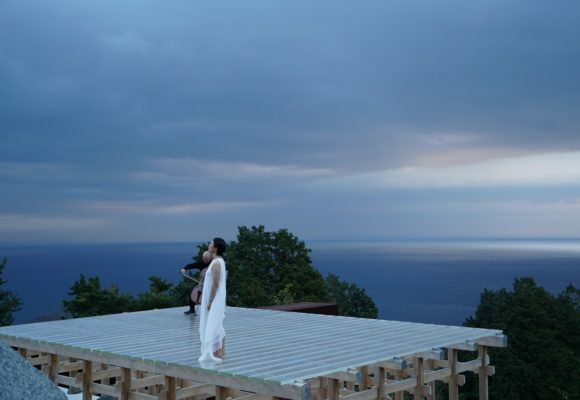 The first piece, “water and tears” was a duo performance by Shiki Kitamura and Kozue Takamiya. Shown it in the USA last year, this time the piece featured a young female dancer, and even when the two performers moved while making contact with each other in a seemingly floating manner, their positions were just as accurate as their timing of acceleration and deceleration. Both Kitamura and Takamiya operated as two perfectly autonomous bodies who had mastered Seki’s own body language to the extent that one could easily forget that their movements were choreographed. In moments when they touched and rubbed their bodies and hands against one another, the air was filled with a subtle sense of eroticism, whileYuji Tsutsumida’s minimalistic sonic accompaniment combining sounds of water and chirping birds worked very well as a moderate accent. So what exactly is the specific quality of minute, super slow movements? To use a rather far-fetched metaphor, the sound of water reminded me of the humidity inside a tunnel. There is something like the strength of a large structure that is maintained through leaking water. 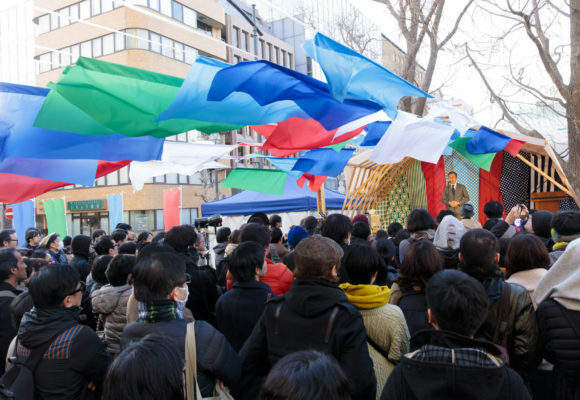 In the case of Seki’s work, rather than the structure itself, it’s the leaking water from where the images spread out. This is a sensuous, haptic kind of effect, whereas the absence of such worldly interests as presenting it in a theatrical style makes it all the more a tricky operation. Following after a short break was the second piece, “hi wo mu gu,” and this was an even crisper display of Seki’s advanced choreography. In addition to Kitamura and Takamiya, the piece featured Teita Iwabuchi, Shun Shimizu, Takashi Suzuki and Yui Yabuki, so it was a lineup of three male and three female dancers. Their entrances and exits, the way they leaned their bodies against each other in varying formations, and every now and then, a sudden change of speed and electronic sounds that disturbed the super slow motion that otherwise dominated the piece – all of these elements were thoroughly composed into a whole. Symmetrical shapes and anything that is predictable or consistent is deliberately avoided, and like in an informalist painting, there is no focus. 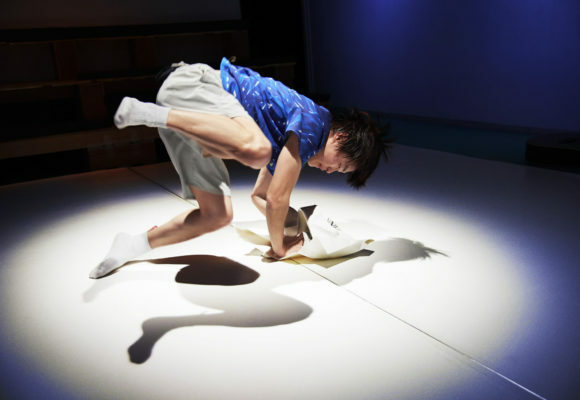 In the wake of her impressive award-winning performances in 2012 – “Hetero” at Yokohama Dance Collection, and “Marmont” at the Toyota Choreography Award – “hi wo mu gu” continues in the same vein, however it contains several newly introduced elements, such as time-lagged movements, simultaneous progressions of different elements, and gestures including the relaxation of body parts. “hi wo mu gu” seems to be what crystallized as a result of Seki’s approach cultivating her own methodology in a straight and direct manner, although one has to say that this particular time-space feels as closed as it is complete. It appears to me that, the moment the artist comes up with a strategy to break through that time-space and enter a new phase is the moment whena new imagination will germinate on the stage as well as in the audience. Kaori Seki Co. PUNCTUMUN "midu tsu namita (water and tears)" "hi wo mu gu"